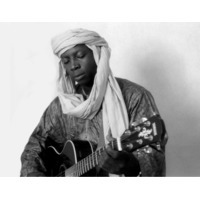 Boureima "Vieux" Farka Touré is a Malian singer and guitarist. He is the son of Grammy-winning Malian musician Ali Farka Touré. Touré was born in Niafunké, Mali in 1981 to Ali Farka Touré. Despite his father's discouragement and his family's lineage as a tribe of soldiers, Touré secretly took up the guitar and enrolled in the Institut National des Arts in Bamako, Mali. In 2005, Eric Herman of Modiba expressed interest in producing an album for Touré; to do so, he had to acquire permission from Ali Touré, Toumani Diabaté, and other community elders. This led to his self-titled debut album, produced by Modiba and released by World Village on 12 February 2007. The album featured Toumani Diabaté, as well as his late father. Following the release of a remix album, UFOs Over Bamako in 2008, and multiple tours, Vieux released his second studio album in May 2009. Fondo peaked at #5 on Billboard's World Albums chart the week of 11 July 2009 and was included in the Village Voice's Top 100 list for 2009.